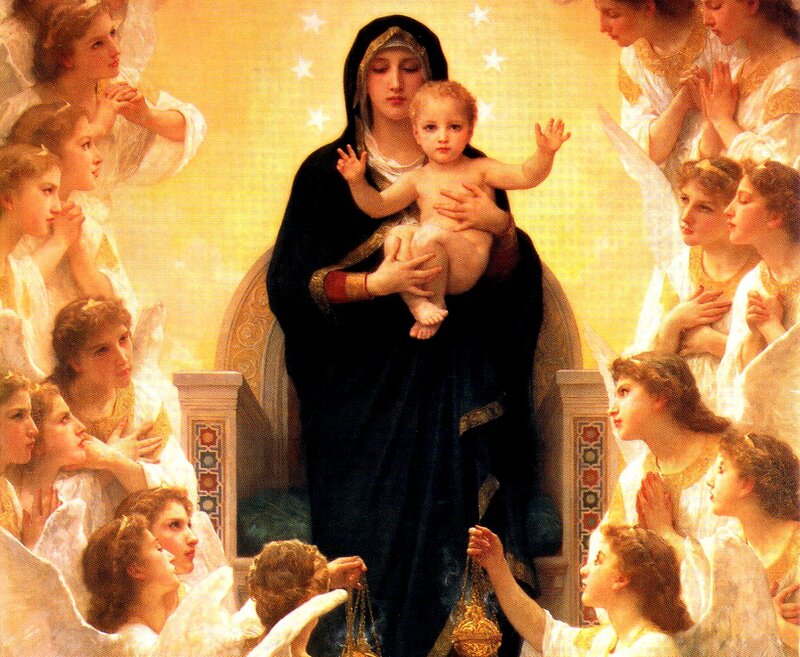 …what’s the big deal with crowning Mary and devoting a whole month to her? While that’s a loaded question… why would I want to get to know Mary? She’s ONLY the Mother of God. As Christians, we make it a point to be followers of Jesus Christ. We strive to have that intimate relationship with our Lord Jesus Christ, our Savior, because it is only through Him that we can be with God, the Father, in Heaven! I’m not gonna lie. I, too, strive to have that intimate relationship with Jesus. And I’m of the type who does better imitating others or being around those who inspire me to grow in that relationship. I’m blessed to currently be surrounded by those who genuinely seek that close relationship, but the reality is…no one is perfect. Let’s think for a moment. Who has walked on this earth that has the most intimate relationship with Jesus Christ? Who knows Him at a level so much deeper than our own faith and understanding? The answer is … Mary. I mean, she only gave birth the Jesus. Fed Him. Changed His clothes. Taught Him socially acceptable manners for that time period. Made Him work. She witnessed His growth from little boy to adult. And she was there with Him til the bittersweet end. All that and more. And she is the perfect, human example of what it means to be Christian having that intimate relationship with Christ. No, I’m not saying we have to change Jesus’ diapers in order that we know Him better. I’m saying that she has that deeply intimate understanding of her Son that any loving and caring mother would have for her child. Undoubtedly she accepts Jesus Christ into her heart by simply being His mother. And fulfilling her role as His mother as well. There isn’t a lot of verses about her in the Gospels, but with what little we do know about her from Sacred Scripture is that her life was very much oriented towards her Son, which ultimately orients her towards God. Even today and in recent history (through the various times she has appeared to people across the world), she points back towards her son. Truly, she deserves attention. As Christians, we know that by getting closer to Jesus, we can get closer to God. But I think by getting closer to Mary, we get closer to Jesus. Her life points to Jesus. A good example is the Wedding of Cana in the Gospel of John, Chapter 2. “Do whatever he tells you.”, she said to the servers when they were freaking out because there wasn’t any more wine to be merry. And Jesus told them to fill jars up with water that later became wine. And they listened. And the party went on. What I love about Mary is that even though the details of her life with Jesus aren’t explicitly detailed in the Gospels…we can still reflect on her life and imagine what it must be like being with Jesus every step of His life. It’s like what I said earlier. Once I get to know my friends’ moms, I feel like I know my friends better. And Jesus is my friend too.